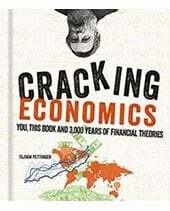 Home > Economics help blog > economics > Does cutting corporate tax rates increase revenue? Does cutting corporate tax rates increase revenue? Lower tax rates enable firms to invest more – this leads to higher growth and therefore, higher tax revenues. Lower tax rates reduce the incentive for firms to use tax avoidance schemes. However, there is no guarantee that a lower corporation tax rate will encourage firms will move to the UK/US. It depends on the economic climate and also any potential response from other countries (other countries may feel obliged to cut taxes too. Also, there is no guarantee that lower tax rates will encourage firms to invest. Many firms already have high savings and spare cash. Investment depends primarily on expectations of future growth. If there is no significant increase in investment, a lower tax rate will, ceteris paribus, lead to lower tax revenue. It is also possible that after a tax cut, total tax revenues will rise – simply because firms are becoming more profitable, due to economic growth and/or firms taking a bigger share of national GDP. Without the tax cut, tax revenues would have risen even more. It is also important to see the share of national income collected by corporation tax. 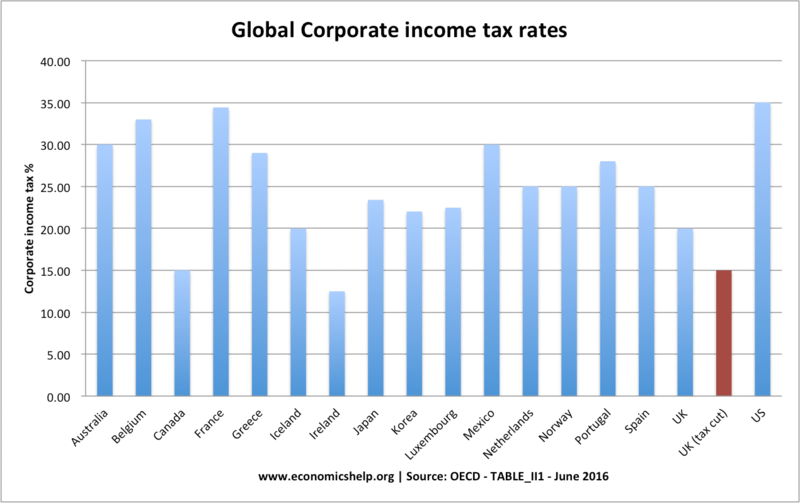 In recent decades we have seen lower corporation tax in most major OECD economies. 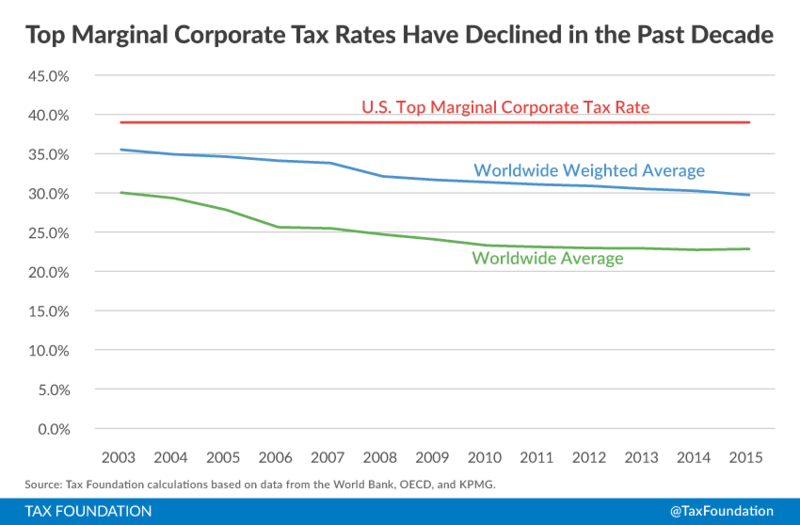 In other words, the world has seen a general fall in global corporation tax rates. This could be attributed to the competitive tendency to try and get the lowest tax rate or at least the need to keep up with other countries. For example, the Tax Foundation article, suggests there is strong pressure for the US to cut its corporation tax rate to remain competitive and avoid losing profitable IT giants seeking to avoid paying US tax rates. This suggests there could really be a ‘beggar my neighbour’ attitude to corporation tax rates, and cutting tax rates does encourage other countries to follow suit. Why no global competition for income tax? One question might be – why do we not see this with say income tax rates? For most workers, the option of moving to work in the US because of lower income tax rates is not practical. Perhaps for some highly paid financial sector workers or even doctors – this may be an issue. But for the vast majority of workers, they will not move to another country because of differing income tax rates. However, for multinational companies paying millions of dollars in corporation tax – it is worth the effort of moving to a lower tax rate regime. 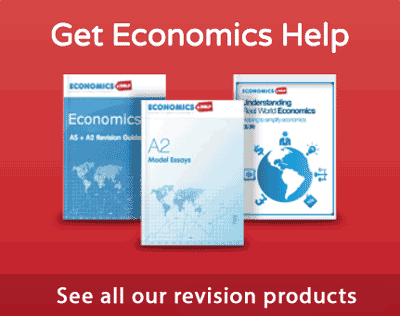 Does cutting corporation tax rates change revenue? The link between corporate tax rates and income is not clear. This plots corporate income tax rates (%) and corporate income tax revenues as a % of GDP. This states there is a very weak relationship. A corporate tax rate of 60% can give same tax revenue as a corporate tax rate of 15%. You can look at this in two ways. You can argue raising corporation tax rates will have little effect in increasing tax revenue. Or cutting tax rates has no impact in decreasing tax revenues. You could argue that lower corporation tax enables more retained profit to be used for investment. Therefore, cutting corporation tax could help increase economic growth – regardless of how other countries react. However, in the era of higher corporation tax (the 50s and 60s) – we saw higher rates of economic growth than in the past decade with much lower corporation tax rates. An important question is what percentage of the increased retained profit will be used for investment or whether it will be used to increase cash reserves/dividends to shareholders. However, it is difficult to make assumptions based on this graph. The impact of a change in corporation tax cannot be taken in isolation. It depends on what other countries do. 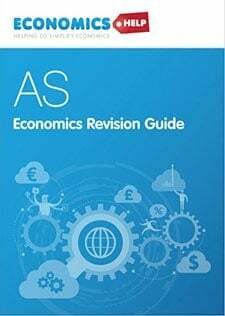 For example, if the UK cut corporation tax rate to 15% and others maintain the same tax rates – you could expect it to increase inward investment and possibly tax revenue for the UK. However, if others follow suit and cut to the same rate, there will be a very different effect. The UK will not gain any competitive advantage from the tax cut. 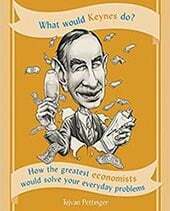 It becomes an example of game theory – the outcome of a choice on tax rates – depends on how other countries respond. The big question is how will other countries respond to the UK cutting corporation tax rate? Perhaps with losing access to Single Market, they may not feel threatened and not cut corporation tax. Alternatively, they may feel it is an attempt to gain an unfair advantage of inward investment and respond in some form. 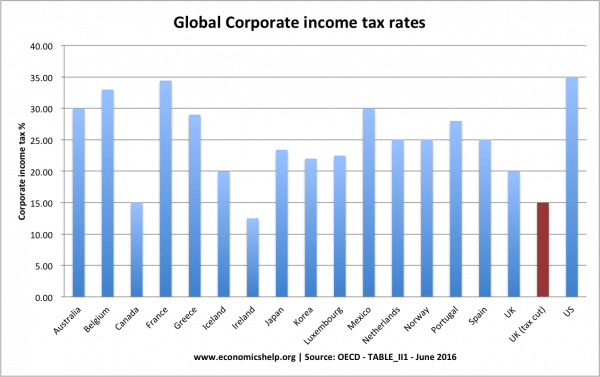 In the short term, there is maybe a benefit from cutting corporation tax – to have a lower rate than other countries. This lower rate will be a factor in encouraging investment and firms to have their tax base in low tax countries. However, this initial benefit of lower corporation tax has to be viewed in light of general downward trend in corporation tax rates. 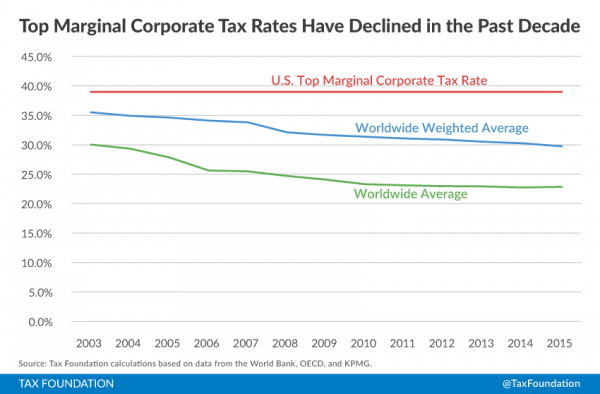 Cutting corporation tax rates has become a general global trend. If UK cuts corporation tax, you would expect some of our competitors to follow suit and this competitive tax advantage may be short-lived. If this does occur, the main beneficiaries are companies who get to keep a bigger share of profit. The taxpayer loses out because income and expenditure taxes have to rise to compensate. However, this is complicated by the fact lower corporation tax (regardless of global competitors), may give more retained profit and encourage firms to invest more in future capacity, increasing economic growth. There is a good welfare case for efforts to harmonise corporation tax rates to avoid tax competition, tax avoidance and the rise of huge cash reserves which lead to a welfare loss. 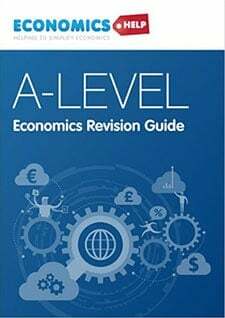 This entry was posted in economics and tagged tax. Bookmark the permalink. I would think Quantitative Easing and greater capital requirements from regulators no doubt contributed to the increased capital reserves.